What is it about Smetana? As we walked across Charles Bridge, having been in Prague less than an hour, I realised that I had developed an earworm. My subconscious orchestra was repeatedly rehearsing the final section of ‘Vltava’, the river flowing beneath us. Surprising, as we were surrounded by noise; river boat hooters, tram bells, traffic and maybe a dozen languages, including a group speaking in broad Lancashire dialect. This soundtrack is not new for Prague, historically a melting pot of nationalities, religions and languages. The Munich Agreement saved Prague from bombs, yet brought to a close Czechoslovakia’s brief First Republic, only 20 years after it began. Prior to the First World War it had been ruled by the Hapsburgs; in 1948 it underwent a communist takeover, which remained in force until the Velvet Revolution of 1989. Political history is reflected in buildings. Contrasting with the 12th century Romanesque church close to Hradcany Castle, the shops and offices in Wenceslas Square demonstrate Art Nouveau, Art Deco, Cubist and Modernist architecture. Both Prince Charles and Mick Jagger recognised the importance of this rich mix; Prince Charles donated towards works on the Castle, and Mick Jagger contributed to the restoration of the Spanish Gallery. Yet our guide informed us that the economy is not primarily dependent on tourism, but industry. Of course, we had forgotten about Skoda cars, Bohemian glass and Pilsner beer, first brewed in the ‘citizens’ brewery’ in Pilsen. We aimed to experience as much as possible during our brief visit; easily done as everywhere was within walking distance. We learned about the castle servants who lived in the miniature houses of Golden Lane, and how their lack of sanitation brought complaints from the local convent. We watched fireworks illuminating the statues on Charles Bridge; and ate Moravian Sparrow [dainty pork medallions] and Dumplings in Café Slavia accompanied by the inevitable Pilsner. Round the corner the Old Jewish Cemetery slumbered under the weight of 12,000 headstones, the last burials taking place in 1787. We spotted Franz Kafka’s workplace during his time as an insurance clerk, and made an early morning visit to the Holy Infant of Prague. Still our minibus arrived too soon. Planning our return, we set off for ‘Saxon Switzerland’. The following morning Wagner took over. Half an hour into our first walking day we were confronted by a giant statue of the great composer gazing steadfastly towards the path. Our walk leader announced a drinks stop just as the overture from Rienzi drifted through the trees. Not an earworm this time; one euro in the slot activated the music, dislodging Smetana and the Czech Republic, starting the accompaniment for die Malerweg, the Artists Trail. This area was first discovered by artists including Canaletto during the first half of the eighteenth century, and became a mecca for the Romantic movement. Die Bastei Visited by Mary Shelley, Turner and the inspiration for Lohengrin, Saxon Switzerland’s landscape is unique. Massive sandstone rock formations, distorted by centuries of erosion, rise from the countryside bordering the Elbe valley. 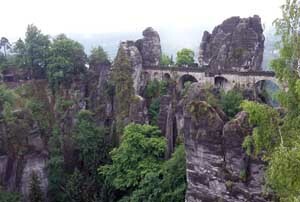 Die Bastei towered over Wehlen long before Julia Bradbury arrived; Caspar David Friedrich was moved by this scenery to paint his famous ‘Wanderer above the Mists’. Appropriately for us, on our visit Die Bastei [named for the fortress it resembles] was wreathed in fog. Ethereal, evocative and matching the grandeur of Wagner’s overture it guards the Elbe, even more impressive than the man-made Konigstein Fortress on the opposite side of the river. The Malerweg was created in 2006, by the tourist association working with local partners. The original route taken by the Romantics from Dresden into Saxon Switzerland had changed with the arrival of the railway, and careful research resulted in a new trail of 112 km, starting at Pirna-Liebethal, following the right side of the Elbe towards the Czech border, then crossing the river to return to Pirna, appropriately finishing at the Canaletto House in the town square. 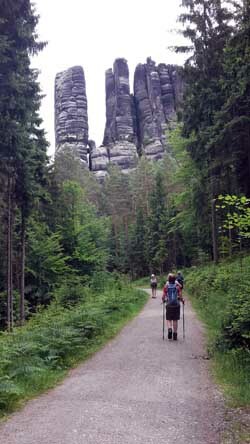 No surprises the following year when it was voted the ‘Most beautiful hiking trail in Germany’. It does not disappoint. Wagner never really left me, but on Day 3 Beethoven joined in, his Pastoral Symphony very appropriate and strangely soothing, especially in the Polentzal Valley where a descent of 870 steps was followed immediately by an ascent of 550. This area had attracted hikers since 1830, so we found the walks very user-friendly and the daily café stop always at an excellent viewpoint. On 'village days' we noted the popularity of quirky wood carvings in stunning gardens; even the disused linoleum factory, bizarrely lurking in Kohlmuhle, did not detract from the charm of this hamlet hiding deep in the forest. It was there that we had our only dog incident; a very large unidentifiable breed, powerfully built, launched himself at a garden gate barking furiously, just as we passed. Picking up our poles, water bottles and various accoutrements we quickened our pace. Silence fell. Three minutes later we heard the performance repeated and turned to see a group of German hikers striding briskly behind us, not looking back. Our canine friend was amusing himself, he could have cleared the gate with inches to spare. He was guaranteed regular entertainment, living directly on the Malerweg. One of the ‘big’ days involved tackling the Schrammsteine, a huge outcrop, its warm sandstone colour belying the harsh jagged rocks along the ridge. We approached through a silent gorge, sounds muffled and sunlight diffused by dense conifers. Beethoven’s Moonlight Sonata drifted through this unearthly forest. But not for long; we scrambled up a diverse collection of steps, some natural, before a steel ladder, bolted into the sheer rock face, took us onto the ridge. A quick burst of Die Valkyrie was inevitable at that point. To be followed immediately by Waltzing Matilda, as the surrounding panorama was more reminiscent of the Blue Mountains of New South Wales than anywhere we had seen in Europe. Dense woodland punctuated by rock formations thrusting upwards. It appeared impassable, yet later we walked among pine trees surrounded by massive boulders. The stillness and solitude, and an uncanny light, animated the rocks. Some tumbled downwards towards the track, like ruined shanty towns. Others hunched under the trees, a robber gang. Natural versions of Easter Island statues threatened in the darkness, and in my head ‘The Hall of the Mountain King’ approached its clashing finale. Thanks, Grieg. Different days, different tunes. The tiny village of Reinhardtsdorf conceals a magnificent Baroque church and Bach’s Toccata and Fugue provided a fitting backing track while gazing at elaborate architecture and detailed wall paintings depicting Old and New Testament stories. We had previously seen galleries in churches; but not on three levels! How had it survived amidst the turbulent history of the area? A coffee stop in a Gasthaus built in 1587, public rooms lined by dark wooden panelling elaborately carved, raised the same question. More reminders of this were all around us; we gained the best viewpoint on the Grosses Winterberg by climbing a lookout tower, built under communism. In this area frontiers and nationalities are a fluid concept. This was highlighted on our rest day spent visiting Konigstein, the fortress dominating the Elbe and surrounding countryside. Konigstein had started construction in the Kingdom of Bohemia sometime in the 12th century. Used by Saxon dukes and Prince-Electors as a hunting lodge, refuge in war and a feared state prison, it remains one of the largest hilltop fortifications in Europe and was never conquered. Despite expert military modifications, by the early 19th century the development of long range guns rendered it obsolete. Later used to imprison POWs in both wars, it had also housed priceless art works from the Dresden Zwinger within its impregnable casemates. In 1942, the French General Henri Giraud managed, unbelievably, to escape. Using a makeshift rope he descended the fortress walls and the cliff below, caught a train to Bad Schandau and made his way to Switzerland. His disguise consisted of shaving off his moustache and donning a Tyrolean hat. Yes, today it has to be La Marseillaise. We noticed something else during our fortress visit; a large number of dogs in the queue for tickets, admittedly with their owners. Had we spotted a social phenomenon peculiar to this area? Sedate visits to properties in the UK might throw up the odd Border terrier or suchlike; here were breeds ranging from Giant Schnauzers to Dachshunds with occasional incomers, including a corgi. He did look slightly confused. However most canine visitors were gazing keenly around them, not, we hoped, looking for walkers to terrorise, but taking in the atmosphere and surroundings. Refreshing that it is socially acceptable to take your pets on cultural outings in Germany. Our final walking day took us back alongside the Elbe; once Bohemia’s Woods and Fields, now Germany or ‘Saxon Switzerland’. Smetana faded while Beethoven’s Pastoral returned. The shifts in music reflected changes in state borders, emphasised by language. In the German countryside many of our generation spoke very limited English, if any. They had been educated during the Soviet era; their second language was Russian. This area had existed under many regimes; on occasions its inhabitants were forced to change nationalities and even had different religions imposed upon them. Yet they retain their cultural identity through art and literature, inspired by the beauty of the landscape. As the music fades away I am optimistic; here culture has stood the test of time. It has survived while empires have fallen.